This is not my typical review. I don’t have to discuss voice acting, action scenes, or puzzle types that make adventure players cringe. This is a text adventure game with the advantage of a point and click interface and good graphics. It’s a hybrid where you can play a text adventure without typing, and there are puzzles. I have not played a text or interactive fiction game since way back in the nineties, I believe at a time when I owned Tandy 1000 machine, well before Windows. As the information available states, the length of the game is eight plus hours of content with over 78,000 words. It is the text equivalent of a full-length novel! That word count might be the norm publishers prefer, but I'd rather a novel contain 100,000 words. But that is neither here nor there. Basic requirements are listed on the game website. They appear to me to be minimum. I’ll begin with the story. 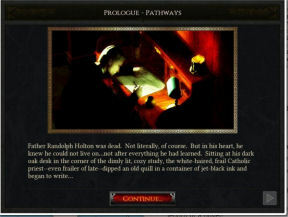 It is a remake of the original point and click adventure game from 2004, in text form. I have not seen that game so I will not comment on how it compares to this version. 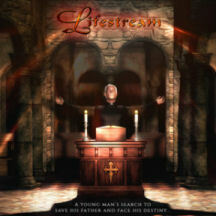 Lifestream is billed as containing additional detail and extended game play, beyond what is found in the original game. The characters are Father Randolph Holton, who presents as dead, not physically but emotionally. He is troubled by a spiritual fall years ago, and now he is missing. Enter the second actor, his son John Holton, whose existence is the reason the priest is troubled over the state of his soul. Read and click through the prologue and see an elderly man clad in priests' attire, writing at an oak desk. He seems distressed and anxious, as if he is too deeply invested in whatever he is writing. See a young man named John Holton waking from a dream in his bedroom. Learn that his father, Randolph, has been missing and his son decides to search for him on his own. He learns that his father is a priest. John can assume he is the man from the earlier scene, so he does not want to involve police, as priests are supposed to be sworn to celibacy. The son has questions. We have a book length novel telling the story, incorporating a mystery while utilizing supernatural elements. It is a well written story. This is a text adventure game with a unique interface that is pleasant to navigate. It includes compass navigation, an inventory through which you can combine items, an archive of journal entries and other readable materials, and more. There are puzzles in the form of questions where you select the correct answer from a list, or do things in the right order. I mentioned the rock earlier. You had to pick that up, which goes into your inventory. One of the screen shots, labeled “Basement,” shows your basic screen. It is not your opening screen of course, but it typifies the game screen. It is where you play the game. On the left, several icons are presented. 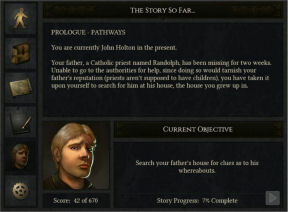 You are in the basement and you have choices where you may examine the highlighted Church Bulletin featured in this screen. Often there are several choices to examine. You can go to another room by clicking a lighted direction in the compass. The second icon represents a backpack. Clicking on that reveals your inventory. 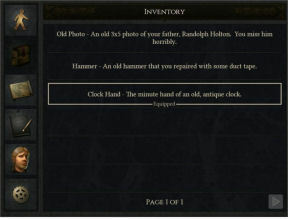 Use inventory by highlighting an object in your inventory, followed by clicking on the stick figure to reenter the game screen. The item’s name will show below the compass. Clicking on the item will automatically activate the action. For example, when faced with the lock, you click on your rock in inventory and bang. By clicking on one or more items in the inventory you may be able to combine them as you would in any adventure game. The third icon is your map. Clicking on it will bring up a pattern naming the rooms in your locale. The room you are in will be blinking. It helps to orient you with respect to your choices or routes available on the compass. It does not allow you to simply click to go to another location. The fourth icon is your notebook where you store and read items such as letters that you have picked up. The fifth icon identifies the character you are presently playing, and the sixth is for Options and the ability to adjust various settings and access the Main Menu to continue or quit. There are a hundred fifty pieces of original artwork and an hour-long soundtrack. 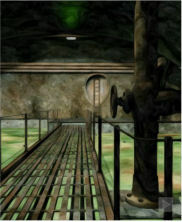 The game also provides a complete walkthrough. I found this game to have a very good storyline featured in an innovative way, blending the old text adventure style with the standard point and click interface. I searched sites such as GOG, Steam and Humble Bundle. It is not available at any of those stores. You can currently purchase the PC version at Storycentric website or the Unimatrix Produtions itch.io website. 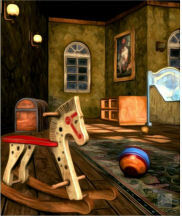 The game is also available as an Android or iPhone/iPad app. You also have the ability to Greenlight the game at Steam on the Storycentric website. For the current low price of $3.99 it is one of the better game options presently available. I did not locate any listing of requirements.